Fancy organising a classy London Christmas party idea with an edgy twist? Why not treat your team to a delicious Mabel’s Christmas eal party in London. 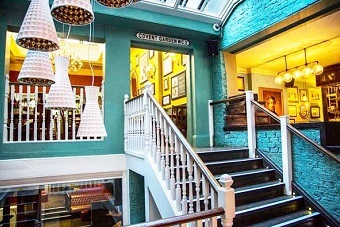 This beautifully decorated lady of Covent Garden is an elegant option for your Christmas meal, and will bring a really unique experience to any Christmas party in the heart of London. Whether you’re looking for lunch or dinner, this menu oozes style and indulgence from the moment you walk in till you’ve polished off your plates, and will definitely be a party remembered by your team! Its’ important to celebrate the Christmas holidays, and what better way to do so than loads of delicious food, drink and good company to kick of the festive season. When you arrive to the London based bar, someone will kindly show you to your table where you can get comfortable and order some drinks. Everyone will receive either half a bottle of wine or 2 bottles of beer each to complement their meal and start off the night with a couple of toasts to the holidays. Then the meal will begin, consisting of 3 courses that are all available to pre order before the day, meaning no extra fuss and more time to have a great time. All of the courses have a variety of options to choose from to satisfy everyone’s taste buds, including traditional Christmas choices like Christmas dinner and pudding, as well as some more exotic dishes like grilled salmon and lemon tarts. All three courses will be brought to your table, meaning no stress for you and your team so you can completely relax and enjoy the food after a hard working year. Once everyone’s polished off their plates, the rest of the Mabel’s Bar Christmas Party in London is totally up to you! The bar offers a variety of different rooms that are open til’ late, making it the perfect place to either chill out in the low lit atmosphere and enjoy some of Mabel’s signature cocktails, or bust a move on their dance floor to some popular tunes and house music, and really make the most of this Christmas party celebration. Give us a call on 0161 341 0052 and our events planners will be happy to organise the whole thing for you!